An example of the new Medicare Health Insurance card. 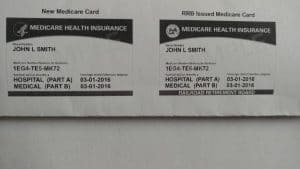 In April, the federal government began issuing and sending out new Medicare cards. This is being done for privacy reasons and to curtail identity theft of seniors. Medicare made the decision to no longer associate your Medicare number with your Social Security number. Starting in April, Medicare began creating randomly generated alphanumeric numbers. A photo of an example accompanies this article. Until you receive your new card, continue to use your current Social Security card and number for your medical coverage. With this change, we may find that there are predators out there who will try to take advantage of seniors during this transition, which will take place over a few months. If you haven’t received your card and you currently use Medicare, don’t worry. It is going to arrive by mail. Medicare and our government are not going to call you on this. If anyone does call you asking if you have received your new card, just hang up. They may say it is being held until you send in your fee. There are no fees! The cards are free. There are no special rules or regulations. Just wait until the card arrives. When you get your new card, you may think that your Social Security card is no longer of use to you. That is not the case. Keep the card! You still need to have it for some legal situations. If you wish to refinance your home and need another mortgage, you may be asked for your Social Security card. You will still be using your Social Security number to file your annual tax returns. There is another reason for keeping the card, too. If you are receiving Social Security and walk on, the Social Security Administration needs to be notified of the situation, and the payments need to be terminated. There may be a possibility that a check has been received that needs to be returned. Your family may need to have your Social Security number in order to handle any final things on your behalf. When you receive your new card and number, be sure to read the accompanying instructions carefully regarding your new card. If you have any questions, I do have an insurance broker that may be called to give you answers. So, don’t hesitate to call me. For those of you that may have a senior in a nursing home but whose mail may be coming to you, be on the alert for the arrival of this new card. Be sure it gets to that relative. Once all the Medicare cards have been issued, they will absolutely be needed to secure medical service in the future by all citizens receiving medical coverage under the Medicare program. I have received a number of inquiries about when District 3 will be holding the 2018 meetings. This year we will hold our North Texas meeting 11:30 a.m. to 2 p.m. June 9. Lunch will be provided. We will be meeting in a classroom at the Grapevine Rec Center. Its address is 1175 Municipal Way, Grapevine, Texas, 76051. We will need to have meeting confirmations no later than June 2 for final room setup and food ordering. Please either call me at 817-229-6271 or send an email confirmation to rwhistler@potawatomi.org. Be sure to include the number that will attend. I am working on securing a location in the Austin or San Marcos area for the South Texas meeting. It could be later in June, and if not, it will be within a month or two. I look forward to seeing each of you. As my peer Roy Slavin has mentioned repeatedly, we would appreciate having email addresses for each of those residing in our districts. By law, the Nation is not authorized to give us your email address or mailing address without your specific permission. I currently have email addresses for less than 10 percent of the number of CPN registered citizens residing in District 3. I don’t send out many emails but do at times find something has surfaced that needs to be told and cannot wait for the next Hownikan printing. For that, only those whose email address I have receive that information. As always, I serve with pride and honor in being your elected representative.